I recently observed a classroom teacher at our school. He started class when the bell rang, students were in their desks, ready to get started. It was obvious that he had established a routine with his students and set expectations about starting class once the bell rang. He quickly pulled up a few problems as a bellringer activity, and his students got to work. While they were working, he took attendance and circulated the room to make sure students were on task. Much of the class went this way. Compliant students, good explanations by the teacher, examples on the board, and guided practice. Near the end of class, he had the students to do a problem independently. When students were finished, he solved the problem on the board and explained the process. Then he asked, "Does everyone understand? Are there any questions?" He looked around, satisfied that no one asked questions, and moved on to talk about homework. How did he know if his students understood or not? How did he really know if all of his students could do the problem independently? By using the method of asking the whole group, "Are there any questions?" he forfeited the opportunity to have students to prove that they didn't have any questions. 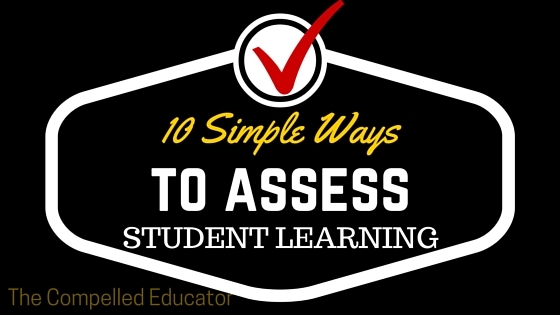 Below are 10 simple ways to assess students and have them to "prove" their learning. Feel free to share other strategies in the comments. Exit tickets. A quick strategy where students answer a question or prompt and write it on a sticky note, index card, or piece of paper. Sticky notes can be placed on a white board for easy scanning and sorting by the teacher. Index cards can be sorted easily. Google Exit Tickets. Teachers can create a short Google form with 3-5 questions. Answers go to a Google sheet where the teacher can see results quickly. Personal white boards. Use 10x13 white boards for each student to show work and hold up for the teacher. The teacher is able to quickly scan the room for misconceptions and/or errors. **No white boards? Two options: Laminate white card stock or place white card stock in clear sheet protectors. Students can use dry erase markers. Think-Pair-Share. Have students turn and talk to a neighbor, sharing their answers and discussing any differences. One-Minute Paper. in one-minute, write everything you can to summarize what you've learned. Tweet the answer. Explain the answer in 140 characters or less. This can be done on sticky notes and posted to the door, whiteboard, or other area where they can be seen and read. Fist to Five. Students can hold up a hand to their chest, using fingers to indicate level of understanding. A closed fist would represent zero understanding, and 5 fingers extended would indicate the highest level of understanding. Teachers can use flexible grouping based on ratings, and can also determine if re-teaching is necessary. Use a T-chart. Have students to use a T-chart to write on one side what they know and feel confident about and what they still have questions about on the other side. the teacher can walk around and scan the T-charts or have students turn them in a "tickets out the door" at the end of class. Kahoot! Kahoot is a game that can be played on students' phones or devices. Teachers can ask a 5-question quiz to check for quick understanding. Kids love the competitiveness of the game! What strategy have you used or seen being used effectively in a classroom? Classroom and school both are the best way to improve our learning skills. Students are manufactured from different organizations and they can get good support, good learning skills, good academic goals, and assured with a good future. The learning process is quite beneficial for students in different educational institutions, as they can get different ways to refine their learning system. So we never deny the importance of educational institute, educators, and leaders in the learning process of students. Thanks for highlighting such important issues.